Inside Cologne Cathedral. Cologne Cathedral is one of the largest Cathedrals built in Gothic style in the world. It was not finished until the 1800s. Gothic architecture are building designs, as first pioneered in Western Europe in the Middle Ages. It began in France in the 12th century. The Gothic style grew out of Romanesque architecture. It lasted until the 16th century. By that time the Renaissance style of architecture had become popular. The important features of Gothic architecture are the pointed arch, the ribbed vault, the flying buttress, and stained glass windows which are explained below. Gothic architecture is best known as the style of many of the great cathedrals, abbeys and churches of Europe. It is also the architecture of many castles, palaces, town halls, universities, and also some houses. Many church buildings still remain from this period. Even the smallest Gothic churches are often very beautiful, while many of the larger Gothic churches and cathedrals are thought to be priceless works of art. Many are listed with the United Nations Educational, Scientific and Cultural Organization (UNESCO) as World Heritage Sites. In the 19th century, the Gothic style became popular again, particularly for building churches and universities. This style is called Gothic Revival architecture. 1 About the word "Gothic"
Gothic architecture was at first called "the French Style" (Opus Francigenum). The word "Gothic" was used later during the Renaissance as an insult, relating to the uncivilized ancient Goths. An Italian writer named Giorgio Vasari used the word "Gothic" in the 1530s, because he thought buildings from the Middle Ages were not carefully planned and measured like Renaissance buildings or the buildings of ancient Rome. He said that, as the barbaric Goths had destroyed the classical world, so this "modern art" had destroyed the architecture of the twelfth century. After Vasari, many other people used the word "Gothic" to describe architecture with pointed arches. At the end of the 12th century, Western Europe was split into different states which were beginning to become the countries that are known today. The Holy Roman Empire ruled a big part of Europe including the modern countries of Germany, The Netherlands, Belgium, Luxembourg, Switzerland, Austria, eastern France and much of northern Italy, apart from Venice. Historians believe Emperor Charlemagne began the Holy Roman Empire in 800 AD. The countries of France and Spain were split into kingdoms. England was ruled by a king whose family also had a lot of land in France. Norway was influenced by England, while the other Scandinavian countries and Poland were influenced by Germany. At that time, there was a lot of trade between towns and states. This caused the towns to grow larger. Germany, Holland and Belgium had many big towns that grew peacefully, often trading with each other. Because of the peace and wealth of these towns, they showed their pride by building huge town halls, often with very tall towers. In England and France, most people did not live in towns. They lived on farms, which were often owned by a rich nobleman (or lord). The house of the lord was usually called a manor house. Italy was mostly split up into small city states which often fought each other. Cities often had high walls and many of the houses built at this time were tall, high towers. In Western Europe, in the Middle Ages, almost everyone belonged to the Roman Catholic Church. The Roman Catholic Church has one head - the Pope. During the Middle Ages, one language was used in churches all across Europe - Church Latin, which had developed from ancient Latin. The churches of each area had a local bishop who came under the Pope. . Each Bishop had a throne where he could sit when priests and people came to him. A church which has a Bishop's throne is called a "cathedral". Cathedrals were usually the biggest and most beautiful churches. In the early Middle Ages, many monasteries were built all over Europe. A group of holy men lived and worked and prayed there. Monks belonged to different "orders" which had different rules. The biggest number of monasteries were homes to the monks of the Benedictine Order. Their monasteries were generally in towns and they often built very big churches called "Abbeys" for the monks and the townspeople to worship in. Other orders of monks, like the Cistercians, did not live near towns. Nowadays their abbeys are seen as beautiful ruins in the English countryside. In France, there were also Benedictines, as well as Cluniac Orders. The great monastery at Cluny, built in the Romanesque style, was the biggest in Europe. The abbey and other buildings were very well planned so for hundreds of years other monasteries were influenced by that plan. In the 13th century St. Francis of Assisi started the Franciscans, who were often called the "Grey Friars" because of their grey-brown robes. The Dominicans were founded by St. Dominic in Toulouse and Bologna. The Dominicans built many of Italy's Gothic churches. Northern France has many famous cathedrals like Chartres Cathedral. Part of the ruined Abbey Church, Cluny. Many Romanesque and Gothic abbeys were planned like Cluny. Almost every monastery had a sheltered "cloister", like this at Toledo Cathedral in Spain. The East End of the Abbey of Saint-Denis is famous as the first truly Gothic building. Abbot Suger was the head of a large monastery just north of Paris in France. The monastery had a large church, the Abbey of Saint-Denis, and also a royal palace where the French kings sometimes stayed. Abbot Suger was a close friend to two kings, Louis VI and Louis VII. In 1127 Suger had the idea to rebuild the great abbey Church of Saint-Denis. He began by changing the "West Front" or facade which was about 200 years old and had only one small door. Suger's grand design had three big doors like the arches on the Arch of Constantine in Rome, which were to let in all the crowds on special Holy Days. The facade also had a big round window in the centre, called a rose window, which was the first one in France. Abbot Suger did not then rebuild the part of the church inside the west doors, the "nave" where most of the ordinary people stood. The next part that he rebuilt was the eastern end. The new East End was dedicated or "given to God" on June 11, 1144. Other architects soon copied the design for other big churches and cathedrals in northern France. After Abbot Suger's death, the rest of the church was also rebuilt in the new style, and got two more much larger and more decorated rose windows, one on either side. The style soon spread to England and through France, the Low Countries, Germany, Spain and northern of Italy and Sicily. Note:- The architectural vocabulary words are written in bold type and are explained and/or shown on the plan and cross-section. "Romanesque" was the style of architecture in Europe before the "Gothic" style. Gothic architecture grew out of Romanesque architecture. There was not a clean break between the two styles. Many of the features of Gothic architecture did not begin in the Gothic period. They were already there in Romanesque architecture, and slowly changed to become Gothic. The main changes were the pointed arch and the flying buttress. These two developments allowed many other changes to happen. Romanesque buildings had thick walls, small windows, round arches and flat buttresses. Gothic buildings had thinner walls, larger windows, pointed arches and large buttresses. All the types of buildings, and the general shape of the buildings were already there in the Romanesque period. The types of buildings were:- the cathedral church, the parish church, the monastery, the castle, the palace, the great hall and the gatehouse. The groundplan of most Gothic churches is shaped like a cross. The long nave makes the body of the church and, crossing it, the arms are called the transept. On the other side of the transept is the chancel which is often called the choir because that is where the priest and the choir sing the services. Some Gothic churches in Germany and Austria and also Milan Cathedral (which was built in the German style) often have nave and aisles of almost the same height and are called "hallenkirke" (hall church). The Cathedral of St. Stephen of Vienna is an example. In some churches with double aisles, like Notre Dame, Paris, the transept does not stick out beyond the aisles. In English cathedrals the transepts always stick out a long way and sometimes there are two transepts as at Salisbury Cathedral. It is at the eastern end that Gothic churches are the most different from each other. In England the eastern end it is usually long and often has two parts. It is usually square or has a "Lady Chapel", a place to pray to the Virgin Mary. In France the eastern end is often polygonal and has by a passage for walking called an ambulatory. Often French churches have a ring of chapels called a chevette. German churches are often like those of France at the eastern end. In Italy, there is no long chancel jutting out beyond the transept. There is usually just a semicircular chapel as at Florence Cathedral. Plan of Amiens Cathedral in France shows a transept that doesn't jut out far, and a ring of chapels at the east. Plan of Wells Cathedral in England shows a second transept near the east end, an eastern "Lady Chapel" and octagonal chapter house for meetings. This picture with parts cut away shows the columns, the stone ribs of the roof and the buttresses of a Gothic church. Lisieux Cathedral shows the nave and the aisles, the upper clerestory windows and the ribbed vault. A skeleton of stonework with great big glass windows in between. The West Front or facade of Reims, showing two towers, three portals with sculptured figures, and a rose window. The East End of Le Mans Cathedral shows a ring of chapels or chevette, the clerestory windows, and flying buttresses. The transept has towers on it. The interior (inside) of York Minster shows clustered columns, vaulted roof, traceried window, ancient stained glass and a stone screen. The interior of Cologne Cathedral shows three stages:- the arcade at the lowest level, the gallery in the middle and the clerestory windows. The "facade" or West Front of a large church or cathedral is designed to make a big impression on the worshippers. One of the best known is Notre Dame de Paris. In the centre of the facade is the main door or portal, often with two side doors as well. In the arch of the middle door is often an important piece of sculpture, usually "Christ in Majesty". Sometimes there is a stone post in the middle of the doorway where there is a statue of the "Madonna and Child". There are many other carved figures in niches set all around the portals. Sometimes there are hundreds of stone figures carved all across the front of the building. Above the middle door there is a large window, which is usually a rose window like that at Reims Cathedral, but not in England, Scotland, Belgium or Scandinavia where there will nearly always be a very large pointed window to let in lots of light. The facade of a French cathedral and many English, Spanish and German cathedrals usually has two towers. Notre-Dame Cathedral, Paris in France. Sainte Gudule Cathedral in Belgium. Large Gothic churches and cathedrals are often very tall. On the inside, the nave is usually at least twice as high as it is wide, which gives the church a very tall narrow look. Some of the churches in France and Germany have naves that are three times as high as they are wide. Cologne Cathedral is an example. The tallest nave is at Beauvais Cathedral which is 157.5 feet high. Westminster Abbey is 102 feet high. On the outside most Gothic churches, both big and small, have at least one tower. In Italy there are domes on the churches, and the tower stands to one side. But in most other countries, cathedrals generally have two towers and quite often have three. Some have even more. Laon Cathedral was planned to have seven, but they were not all built. Sometimes there is just one tower with a huge spire as at Salisbury. Lincoln Cathedral had the tallest spire of the Middle Ages at 527 feet (160 metres). Because a pointed arch points upwards, it makes people look upwards. In Gothic architecture, the whole building is designed to make people look up. There are long narrow columns, long narrow windows and high pointed roofs. On the inside the arches of the roof rise up like branches. On the outside, there are often lots of fancy bits along the edge of the roof and on the tops of buttresses and above the windows. These are called pinnacles. Milan Cathedral has hundreds of them. Salisbury Cathedral, England, has the tallest spire of the 1300s. Uppsala Cathedral, Sweden. Only few churches still have three spires like this. Beauvais Cathedral has the highest Gothic vault in the world. Gothic architecture usually has a lot of windows. Sainte Chapelle is a famous example. At Gloucester Cathedral in England, the East window is as big as a tennis court. Milan Cathedral also has windows of about the same size. The flying buttresses which arch across the roof of the aisle were used to support the roof above the windows, so the walls did not have to be so thick. The columns of the inside, the ribs of the vault (or roof) and the flying buttresses, made a strong stone skeleton. in between these parts, the walls and the filling of the vaults could be of lighter thinner material. Between the narrow buttresses, the walls could be opened up into large windows. Through the Gothic period, because of the pointed arch, Gothic windows were able to change from simple openings to very rich designs. The windows were very often filled with stained glass which made coloured light in the building, and was used for story-telling pictures. The clerestorey windows and buttresses at Saint-Omer Cathedral from the outside. The clerestory windows at Reims from the inside. 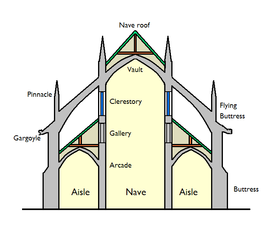 The flying buttresses mean there is no need for thick walls to hold the vault up. The windows at Chartres Cathedral are famous for their ancient stained glass. Sainte Chapelle is a Chapel built for a French King. Pointed arches were used in Persian architecture, and from 641 AD onwards, they were a feature of Islamic architecture. Knowledge of the pointed arch spread into Europe through the Crusaders who travelled to the Middle East from 1096 onwards. Also, Islamic forces had taken over parts of Spain, where they built cities and Mosques with pointed arches. Architectural historians think that the pointed arch was also used by some European architects because it was a very strong way of making an arch. In Gothic Architecture, the pointed arch is used in every place where an arch is needed, both for strength and for decoration. Gothic openings such as doorways, windows, arcades and galleries have pointed arches. A row of arches is called an arcade. A row of arches that is up high on a building is a gallery. Rows of pointed arches were used to decorate walls. This is known as blind arcading. Often walls were made with tall narrow arched openings in them that could be used to stand statues in. An opening like this is called a niche which is pronounced "neesh". An arched roof built of bricks or stone is called a vault. In the Romanesque period before the Gothic, some churches had vaulted roofs. They were always based on perfectly semi-circular shapes. There were two main ways to make a nave vault in the Romanesque period. A vault could be long like a tunnel. Churches with this type of vault were always rather dark. Or it could be square, like two tunnels crossing each other. This meant that the columns that carried the vault always had to be placed on a perfectly square ground plan, which was not always possible. One of the good things about pointed arches was that they could be narrow and tall, or flattened and wide. Using pointed arches, architects could make vaults of very different shapes. They did not even have to be rectangular. A Gothic architect could make a vault with one side narrow, two sides wide and the last side even wider. They could make a vault with three sides or five sides quite easily, by using pointed arches. The vaults were made of ribs which met each other at the highest part of the vault. In between the ribs were sloping surfaces of stone or brick that could be much thinner and lighter than the ribs. At first the pattern made by the ribs was quite plain, like Romanesque vaults, but architects, particularly in England, soon started adding small ribs in between the main ones and making different patterns. Some vaults like this can also be seen in Spain and Germany, but not usually in France or Italy. A simple ribbed arch decorated with fresco in Italy. The vault at Exeter Cathedral has many ribs. It is the longest Gothic vault in the world. This vault in Spain has many small curved ribs in between the supporting ones, to make a rich pattern. "Fan vaulting" like this, at King's College Chapel, is only found in England. In the Gothic period the shape and style of pointed arches changed. But the changes were not the same in every country. With pointed arches, windows could be made very large. Architects made many designs of pointed arches crossing each other in different ways. These designs were often used in windows, which look as if they are filled with beautiful stone lace. This is called "tracery". The stone tracery was used to hold the glass in place. An Architectural Historian can often tell just how old a part of a building is by looking at the window tracery design. The simplest Gothic arch is a long opening with a pointed arch known in England as the lancet. A "lancet" is a sharp knife, so these windows are knife-shaped. Very often lancet windows are put together in a group of three or five. Salisbury Cathedral is famous for the beauty of its Lancet Gothic Architecture. In England the style is called "Early English Gothic". York Cathedral in England has a group of five lancet windows that are 50 feet high and are still full of ancient glass. They are called the Five Sisters. These simple windows are also found at Chartres Cathedral and Laon Cathedral in France. They are the most usual sort of Gothic windows in Italy. Many Gothic openings have tops that are based upon an equilateral triangle. The Equilateral Arch has a very pleasing look and gives a wide opening useful for doorways, arcades and big windows. These arches are often filled with tracery in circular designs. In England this style is called Geometric Decorated Gothic. It can be seen at many English and French Cathedrals, for example Lincoln cathedral in England and Notre Dame in Paris. Some Gothic windows have designs in the tracery, or even in the top of the window itself, that rises up like a flame. This is called Flamboyant Gothic. Tracery like this makes a very rich and lively effect. Some of the most beautiful and famous windows of Europe have this type of tracery. It can be seen at St Stephen's Vienna, Sainte Chapelle in Paris, at the Cathedrals of Limoges and Rouen in France, and at Milan Cathedral in Italy. In England the most famous windows like this are the West Window of York Minster with its design based on the Sacred Heart, the East Window at Carlisle Cathedral and the East window of Selby Abbey. Architectural Historians sometimes argue about which of these is the most beautiful. Flame-shaped arches are not as strong as ordinary pointed arches. It is never used for making a vaulted roof. If this shape is used to make a doorway, there is generally another stronger arch around it. Another way is to make a square topped door that has Flamboyant decoration over the top. In France there are many doorways, both in churches and in houses, that are like this. They are rare in England but there is one at Rochester Cathedral. In England the Flamboyant style was used wall arcading and niches. The most famous examples in are in the Lady Chapel at Ely, the Screen at Lincoln and the facade of Exeter Cathedral. In German and Spanish Gothic architecture the Flamboyant style is often used for opnwork stone screens. The famous "pulpit" in Vienna Cathedral is made like this. The Depressed arch is wide and looks as if it has been pushed almost flat. When arches like this are used to make great big windows they need to be supported by many tall thin vertical shafts and horizontal transoms, so that the window looks as if it has been divided up into a grid (lots of rectangles). This sort of decoration is used on walls as well. In England the style is called Perpendicular Gothic style. At Gloucester Cathedral the Perpendicular East Window is said to be as large as a tennis court. There are three very famous large chapels in this style- King's College Chapel, Cambridge; St. George's Chapel at Windsor Castle; Henry VII's Chapel at Westminster Abbey. The other famous example is Bath Abbey. The south transept facade at York Minster has "lancet" windows. The windows in the Chapter House at York Minster have "equilateral" arches filled with "Geometric" tracery. The windows at Limoges Cathedral in France have "Flamboyant" tracery. The vault at King's College Chapel, England, has "depressed" arches and "fan vaulting". A Gothic cathedral was designed to be like a model of the universe. Everything about the building was designed to tell a message about God. The statues, the decoration, stained glass windows and wall paintings told Bible stories such as how God created the world and how he rules over everything that is in the universe, the seasons of the year and the stars in the sky. Carvings near the door often show the signs of the Zodiac because the patterns of stars in the sky were very important to farming people who did not have calendars to tell them when to plant and when to harvest. Above the main door is often a sculpture of Jesus on a throne, judging the people of the Earth. Many pictures and sculptures are there to remind people to live good lives because they never know what will happen next. Many churches were very richly decorated, both inside and out. the statues were often painted in bright colours but nowadays only tiny bits remain at Chartres cathedral and some other places. Wooden ceilings were usually brightly coloured. Sometimes the stone columns were painted as well. "The Royal Portal" of Chartres Cathedral. "Our Lady of Amiens" at Amiens Cathedral. "The Devil tempting the Foolish Virgins" at Strasbourg Cathedral. The famous pulpit of Stephansdom, Vienna. Even though some things about Gothic architecture stay the same, other things look different in different countries. Different building materials were found in different parts of Europe. This is one of the differences in the architecture between different places. In France, there was limestone. It was good for building because it was soft to cut, but got much harder when the air and rain got on it. It was usually a pale grey colour. France also had beautiful white limestone from Caen which was perfect for making very fine carvings. England had coarse limestone, red sandstone and dark green Purbeck marble which was often used for architectural decorations like thin columns. In Northern Germany, Netherlands, Denmark, Baltic countries and northern Poland there was no good building stone, but there was clay for making bricks and tiles. So many of these countries have Brick Gothic churches and even Brick Gothic castles. In Italy, limestone was used for city walls and castles, but brick was used for other buildings. Because Italy had lots of beautiful marble in many different colours, many buildings have fronts or "facades" decorated in coloured marble. Some churches have very rough brick facades because the marble was never put on. Florence Cathedral, for example, did not get its marble facade until the 1800s. In some parts of Europe, there were many tall straight trees that were good for making very large roofs. But in England, by the 1400s, the long straight trees were running out. Many of the trees were used for building ships. The architects had to think of a new way to make a wide roof from short pieces of timber. That is how they invented the hammer-beam roofs which are one of the beautiful features seen in many old English churches. French cathedrals, and those in Germany and Belgium are often very high, both inside and outside. The transepts do not stick out far. The facades in France nearly always have three doors, a rose window and two towers. There are often facades with doors on the transepts as well as the front. The thing that makes English cathedrals different from the others is that they are long, and look horizontal, like big ocean liners. English cathedrals nearly all took hundreds of years to build, and every part is in a style that is quite different to the next part. (Only Salisbury Cathedral was not built in lots of styles.) The West window is very large and is never a rose window. The west front may have two towers like a French Cathedral, or none. There is nearly always a tower at the middle of the building, which may have a big spire. In Germany the towers and spires are often enormously large. Sometimes they are so big that it was impossible to finish them until modern times. The spires are quite different to English spires because they are made of lacy "openwork". There are also many hallenkirke (or hall-churches) which have no clerestorey windows. The nave and the aisles are about the same height. Like an English Cathedral, a Spanish or Portuguese Gothic Cathedral is often built in many different styles. They are often wide. Spanish cathedrals often have chapels all around them. The roof often has many different types of towers and spires. Often the central towers are polygonal. Italian Gothic cathedrals use lots of colour, both outside and inside. On the outside, the facade is often decorated with marble. On the inside, the walls are often painted plaster. The columns and arches are often decorated with bright coloured paint. There are also mosaics with gold backgrounds and beautifully tiled floors is geometric patterns. The facades often have an open porch with a wheel windows above it. There is often a dome at the centre of the building. The bell tower is hardly ever attached to the building, because Italy has quite a few earthquakes. The windows are not as large as in northern Europe and, although stained glass windows are often found, the favorite way of decorating the churches is fresco (wall painting). Coutances Cathedral in France looks "vertical". Wells Cathedral in England looks "horizontal". Regensburg Cathedral in Germany looks as if there it lots of space inside. Winchester Cathedral in England is very long. Barcelona Cathedral in Spain is very wide. Florence Cathedral in Italy is colourful with brown stone columns and plaster walls painted pinkish-orange. Orvieto Cathedral in Italy has round striped columns and an open wooden roof. Bad Doberan Minster in Germany is in colourful brick. ↑ Stokstad, Marilyn (2014). Art History. Pearson. p. 496. ↑ 5.0 5.1 5.2 5.3 5.4 5.5 Nikolaus Pevsner, An Outline of European Architecture. ↑ Christopher Wren and the Muslim Origin of Gothic Architecture (2003), Foundation for Science Technology and Civilisation. ↑ Freiburg, Regensburg, Strasbourg, Vienna, Ulm, Cologne, Antwerp. The octagonal tower at Valencia Cathedral, Spain. Boney, Jean (1985). French Gothic Architecture of the Twelfth and Thirteenth Centuries. ISBN 0-520-05586-1. Harvey, John (1950). The Gothic World, 1100-1600. Batsford. Summerson, John (1983). Pelican History of Art (ed.). Architecture in Britain, 1530-1830. ISBN 0-14-0560-03-3. Swaan, Wim (1988). The Gothic Cathedral. Omega Books. ISBN 0907-85348-X. This page was last changed on 23 January 2019, at 11:57.